Double-wall vacuum-insulated stainless steel bottles designed to keep liquids cold or hot all day with no condensation. The 750mL wine growler makes an ideal traveling companion for keeping your wine cold or at the optimal temperature all day. Perfect for transporting your favorite wine to just about any outing. Double-wall vacuum-insulated stainless steel bottles designed to keep liquids cold or hot all day with no condensation. The 750mL wine growler makes an ideal traveling companion for keeping your wine cold or at the optimal temperature all day. Perfect for transporting your favorite wine to just about any outing. If you&apos;re feeling adventurous, try making homemade sangria or wine spritzers to take with you. Or use as a decanter to aerate that less-expensive wine you picked up at the market. Makes a great gift anytime of year! Fill one up and surprise your friends at parties, backyard BBQ&apos;s, casual day hikes, trip to the beach, picnics, outdoor concerts, camping trips, or relaxing poolside. 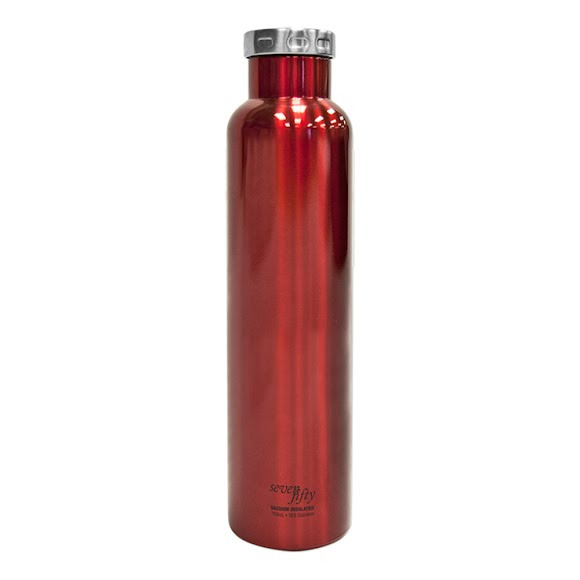 Made of lightweight 18/8 stainless steel that is recyclable, non-leaching and will not retain taste or odor. And even better, the double-wall technology prevents condensation on the outside of the growler to help keep it classy!